Andrew Jackson Higgins, designer and manufacturer of World War 11 landing craft known as "Higgins boats," was born August 28, 1886, at Columbus, Nebraska. His parents were John Gonegle Higgins, a prominent lawyer and judge, and Annie Long O'Connor Higgins. Both parents are buried in Columbus. Higgins attended schools in Omaha and served in the Nebraska National Guard. In 1906 he moved to the South, entering the lumber and shipping business. Higgins's expertise would win him fame in World War II, when Higgins Industries of New Orleans produced more than 20,000 boats. Many were LCVPs (Landing Craft Vehicle, Personnel), a key to the success of Allied amphibious invasions, including D-Day on June 6, 1944. Higgins boats were also used in the Korean and Vietnam conflicts. Higgins died on August 1, 1952, and is buried at Metairie Cemetery in New Orleans. In 1964 Dwight D. Eisenhower said Higgins was "the man who won the war for us." In 2000 the National D-Day Museum opened in New Orleans, honoring Higgins and the city for their vital contributions to the war effort. 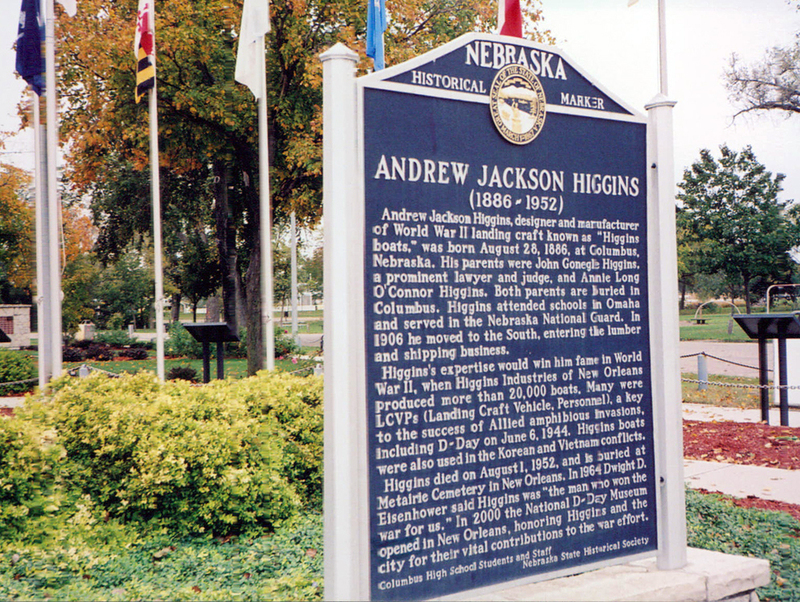 “Andrew Jackson Higgins,” Explore Nebraska History, accessed April 18, 2019, https://mynehistory.com/items/show/414.